This trap skin emblazons the power and beauty of the Sphynx Wrath with a rather majestic set of wings. Along with the impressive wingspan upgrade, the skin also tunes the Sphynx Crystal to accommodate for some fancy special effects and pyrotechnics. Truly, this skin is reserved for hard working champions with discerning taste. The Sphynx Wrath Valkyrie Skin can be used on the Sphynx Wrath. The trap's stats (power, power bonus, attraction bonus, etc.) are not changed. The Sphynx Wrath Valkyrie Skin can be purchased in the Tournament Hall Trapsmith in exchange for 50 Tournament Tokens. Hunters must have a Sphynx Wrath Champion Skin in their inventory to purchase this skin. The Sphynx Wrath Valkyrie Skin cannot be traded on the Marketplace or through Give To Friends. 27 July 2012: The Sphynx Wrath Valkyrie Skin was drawn during FeedBackFriday. 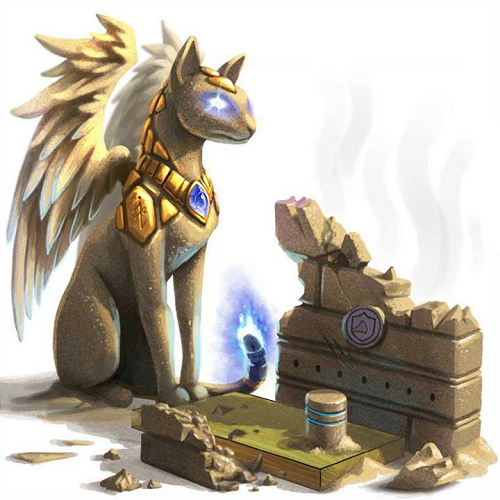 17 October 2012: The Sphynx Wrath Valkyrie Skin was released. This page was last edited on 9 December 2017, at 15:07.